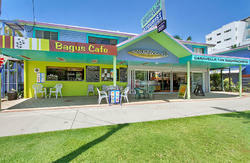 Corona Backpackers is situated in the heart of Cairns city, close to all amenities and attractions. We are 2 minutes from the shopping centre and Woolworths, and a hop, skip and a jump from all bars and clubs in the City. The Esplanade and famous lagoon are an easy five minute stroll away; you really couldn't ask for a better location! Our clean and comfortable dorms accommodate 4 people and include a private fridge (don't forget your BYO alcohol). We also have twin, double and triple rooms available. A discount evening meal is provided to all guests, a local bar just 2 minutes from the hostel. We have a fully equipped kitchen, state of the art laundry and ironing facilities and a common area with a widescreen TV. Secure luggage and valuable storage is also available. Getting onto the net is easy with fast internet and WiFi available. Our computers are equipped with webcams and headsets, making it easier to stay in touch with family and friends! Corona Backpackers offers 10% off your travel, trips, tours, buses and packages across Australia! Our friendly and experienced staff are happy to help in any way that they can. We provide honest and informed advice on all tours and even give a 10% discount to ensure you get the best out of your stay in Cairns. Reception is open from 8am-12pm and 4pm-8pm every day. If you are arriving outside of these hours, please call or email us prior to your arrival and we will do our very best to accommodate you. Thank you! We look forward to seeing you soon at Corona Backpackers! Reception is open from 8am-12pm and 4pm-7pm every day. If you are arriving outside of these hours, please call or email us prior to your arrival and we will do our very best to accommodate you. 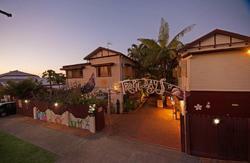 Corona Backpackers is centrally located in Cairns, our street address is 72 Grafton Street. We are 15 minutes from the airport via shuttle bus / taxi and walking distance from the bus and train stations. If arriving on the Greyhound bus, walk past the Reef Fleet Terminal and up Spence Street. Grafton Street is the fourth street on your right-hand side. Corona Backpackers is just past Rydges Plaza hotel on the right. From the Premier bus stop in Lake Street, turn onto Sheilds Street, and take the first street on your left ( Grafton ). Coronas is on the left hand side past the Sky dive shop. If you are arriving by train, from the station go through the Cairns Central Shopping Centre onto Shields Street. Take the second Street on the right ( Grafton ) and we are on the left hand side about 80m along.